The state revoked his mortuary license after reports of decomposing bodies inside his funeral homes and other disturbing allegations. So why was O’Neil Swanson II front and center at Aretha Franklin’s high profile funeral? O’Neil Swanson II refused to talk to the 7 Investigators the last time we looked into the allegations about his Flint funeral home that’s now closed. But he had no problem talking to reporters from Hollywood and national networks about Aretha Franklin’s lavish funeral. The state revoked his mortuary license after reports of decomposing bodies inside his funeral homes and other disturbing allegations. So why was O’Neil Swanson II front and center at Aretha Franklin’s high profile funeral? O’Neil Swanson II refused to talk to the 7 Investigators the last time we looked into the allegations about his Flint funeral home that’s now closed. But he had no problem talking to reporters from Hollywood and national networks about Aretha Franklin’s lavish funeral. And that has the families who say he shattered their trust furious. Decomposing bodies in a maggot-infested garage, bloodstained casket pillows, and complaints about employees working on bodies without protective gear. Those are just a few of the allegations that prompted state investigators to shut down Swanson Funeral Home in Flint last year. Licensing officials also revoked the mortuary science license of O’Neil Swanson II. At the time, O’Neil Swanson, Sr., the owner of the Swanson funeral homes in Detroit and Pontiac, said his son had no legal or business connection with his father’s business. Despite those statements distancing himself from his son, both father and son played a starring role together in the national and international coverage of Aretha Franklin’s funeral. The Detroit-based Swanson’s Funeral Home provided the classic Cadillac LaSalle hearse that carried the Queen of Soul to her final resting place. At the funeral, Swanson II is seen on camera handing out memorial cards, and he wore a gold name badge as he pulled the casket from the church to the waiting hearse. While fans flocked to the public viewing, O’Neil Swanson II gave interviews to CNN, Entertainment Tonight, even to 7 Action News. “I’m just proud to be a part of providing a ceremonial tribute like this one,” Swanson told 7 Action News during an interview. “I can’t believe he’s allowed to do this,” said Patricia Williams. Williams thinks the ashes that she received from Swanson Funeral Home in Flint back in 2012 were NOT from her mother, Myrna Duffer. Williams says O’Neil Swanson II never gave her a straight answer when the funeral home couldn’t find her mom’s body for days. “It’s incredibly painful. You never forget the love of your mother, [it’s] forever is within you. But when something like this happens and you feel she doesn’t have a final resting spot, or maybe she’s still somewhere that we don’t know where she is – we just want to find out,” Williams told 7 Investigator Heather Catallo. Williams filed one of the nearly 100 complaints against Swanson that the state Licensing division has been investigating. His mortuary license was revoked in April, and that means he can NOT work as a Funeral Director. So why was he calling himself that during interviews? Entertainment Tonight labeled Swanson as a Funeral Director. He also told 7 Action News that he was a Director. When Williams saw Swanson on Entertainment Tonight during the Franklin funeral coverage, she was devastated. “It wasn’t a slap, it was a punch in the face and in the gut -- to where you stood up in front of the TV with your mouth open and you had tears in your eyes. And then all the calls started coming to me: from my brother, my father, my cousins, are you watching this? Do you see this,” said Williams. 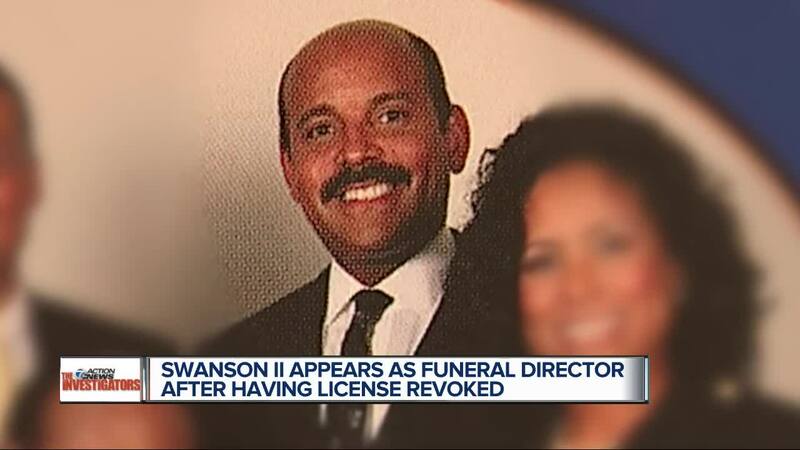 In addition to revoking his mortuary license, the state fined Swanson $34,100. He has only paid $5,000 of that fine that was due back in May. LARA Communications Director Jason Moon says as of today, there are approximately 54 sets of open complaints against O’Neil Swanson II’s license and the license for Swanson Funeral Home Inc.
“Given the large number of open complaints pending a recommendation for additional administrative action, the agency will likely consolidate them as much as possible into one or a small number of formal complaints once the investigations are completed. In addition, the agency, in seeking monetary sanctions against these licensees, is balancing the need to impose punitive sanctions against the ability of victims to obtain or collect upon monetary damages or penalties obtained through private civil litigation or the criminal proceeding against Mr. Swanson. That said, a violation related to their failure to comply with the April 2018 Final Order will likely be included in the recommendations for formal administrative action. In the interim, any applications for reinstatement submitted by either former licensee will be denied,” said Moon in an email to the 7 Investigators. Attorney General Bill Schuette also charged Swanson with ten felony counts for failing to fulfill funeral contracts. Just days after the glamour of the Franklin funeral, Swanson faced Flint 67th District Presiding Judge Pro Tem Nathaniel C. Perry III for those felony charges. Swanson waived his preliminary exam, and the case was bound over to Genesee County Circuit Court. The 7 Investigators caught up with Swanson and his lawyer outside the courtroom. “Is he working as a Funeral Director,” Catallo asked Swanson’s attorney Colin Daniels. “We’re not going to answer any questions,” said Daniels. “His license has been revoked and he’s introducing himself as a funeral director at Aretha Franklin’s funeral. So is he working as a funeral director,” asked Catallo. “We’re not going to answer any questions at this point,” said Daniels. “What would you say to those families who don’t think they got their own loved ones’ bodies back,” Catallo asked Swanson. State officials say they can use information from reports like this to open and investigate new complaints. They will be reviewing the coverage to see if Mr. Swanson was working as a Funeral Director, which would be in direct violation of his license revocation. The families of The Rev. C. L. Franklin and the elder O’Neil D. Swanson have a close friendship that goes back many decades. As a result, a number of members of the Swanson family, who are not involved with the Swanson Funeral Home business, were in attendance at the activities related to the celebration of Aretha Franklin’s life. It was as a long-time family friend of the Franklin family that O’Neil Swanson II was present at those activities including Miss Franklin’s funeral. However, he was not there on behalf of the Swanson Funeral Home, Inc. He plays no role in the operation and management of Swanson Funeral Home (and has not for many years) and he had no official responsibilities or role in the celebration of Miss Franklin’s life. We understand that O’Neil Swanson II was approached by the media during the Franklin activities. To the extent any statements made by him to the media created any erroneous impressions about his relationship to Swanson Funeral Home Inc., we regret that. Members of the public who have questions or concerns regarding the operation of a Michigan funeral home may contact LARA’s Corporations, Securities & Commercial Licensing Bureau at 517-335-5237, Monday through Friday, 8:00 am – 5:00 pm, or by email at LARA-CSCL-Securities-Audit@michigan.gov . If you have a story for Heather, please email her at hcatallo@wxyz.com .